While I grew up in the Chicagoland area and still live here (another story entirely), most of my family lives in the great state of Ohio — specifically Cincinnati. I have a special place in my heart for Skyline Chili, Graeter’s Ice Cream, Montgomery Inn Ribs, LaRosa’s Pizza, Grippo’s Pretzels…you get the idea. But one of my all-time favorite Ohio-influenced foods is the Buckeye — basically a peanut butter ball dipped in chocolate. If you’ve spent any time reading this blog, you’re well aware of my peanut butter obsession, so this Buckeye thing shouldn’t be a surprise to you. 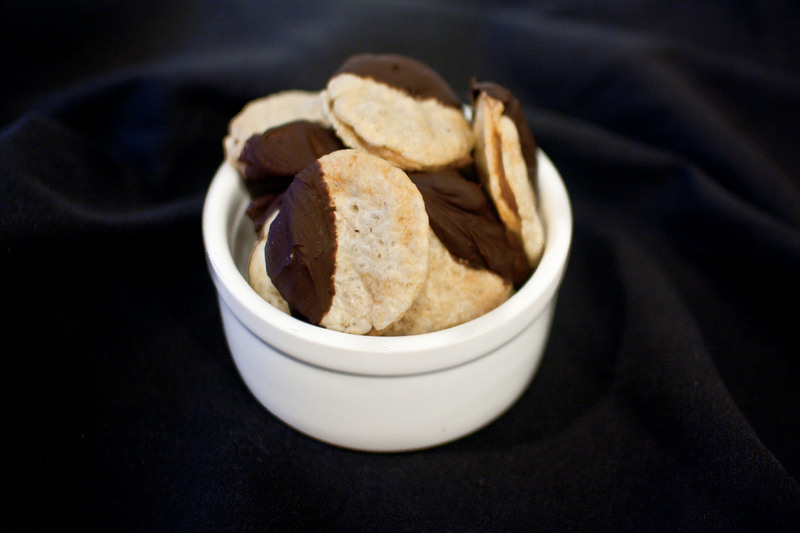 To bring PopChips week to a close, I decided to take the basics of the Buckeye and give it a crunchy spin by sandwiching the peanut butter filling between two of the chips…and then dunking it in chocolate. Not complicated by any means, but pretty darn tasty. Plus I’m pretty much diggin’ the saltiness factor that PopChips bring to the party. In a large bowl, combine peanut butter, powdered sugar and one tablespoon of butter with a hand mixer until well blended. Gently spread a tablespoon or so of the peanut butter mixture onto 20 of the PopChips, and use the other 20 to create a sandwich. 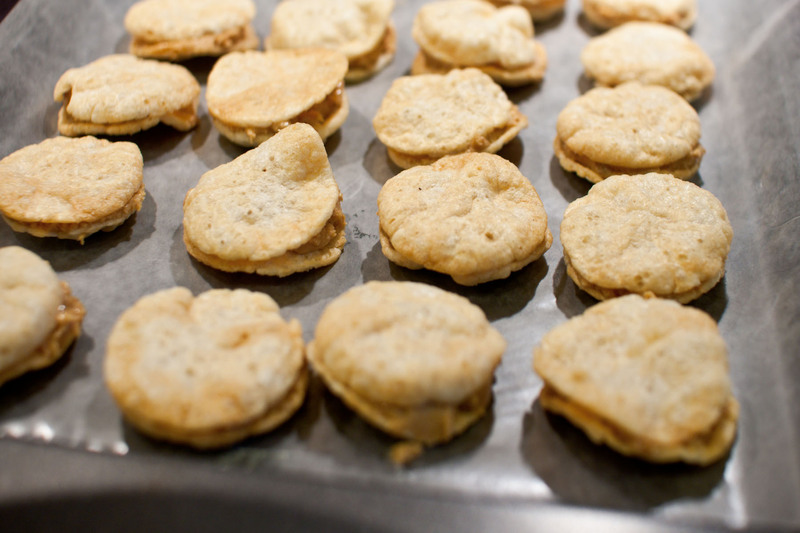 Put the sandwiches on the baking sheet and put in the freezer for at least 15 minutes to harden slightly. In a double boiler, gently melt the chocolate and one tablespoon of butter, stirring constantly to avoid burning. Dip half of each sandwich into the melted chocolate and place back on the wax paper-lined baking sheet. After all sandwiches have been dipped, put the tray in the refrigerator for at least 15 minute to harden. these Crunchy Peanut Butter Chocolate Snackwiches look yummy! Snackwiches!! 🙂 I love it!! Oh I have got to try this recipe! I am addicted to peanut butter and I love chocolate with a salty kick like with pretzels. Never thought of a chip! Popchips really are versatile. Well, actually it seems like YOU are very versatile. Love the idea of putting peanut butter between the salty chips. To dip them in chocolate sounds divine.. This is a super fun way to use our favorite pop chips! You had me a peanut butter…I’ll try these!